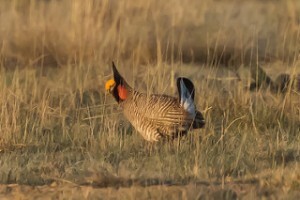 Lesser prairie-chicken numbers are up. Is it good conservation or just good weather? Recent media reports have touted population rebounds for the lesser prairie-chicken – up 25 percent from last year. That’s great news for the bird, which was nearly wiped out in recent years as booming oil and gas industries encroached on the bird’s range across Texas, Kansas, Oklahoma, Colorado and New Mexico. The U.S. Fish and Wildlife Service listed the bird as “threatened” in March 2015, at the same time that the five states embarked on a conservation plan of their own. The plan was officially assembled and endorsed by the five members of the Western Association of Fish and Wildlife Agencies (WAFWA).